On a recent visit with my friend Tricia Robinson, who lives in the small village of St Jeannet, overlooking Nice and the Côte d’Azur, after a huge lunch, we weren’t that hungry for dinner, so we decided to just sip some rosé and wait for inspiration to strike. I was admiring her mortar and pestle, there was some violet-colored spring garlic, a bottle of local olive oil was nearby, and voilà…suddenly, there was our dinner. Frugal me toasted some stale rounds of baguette au levain, which I brushed injudiciously with olive oil that was pressed just a few kilometers away, sold in her village, and scraped them with just-cut garlic cloves while still warm from the oven. (Try it…it’s the best! 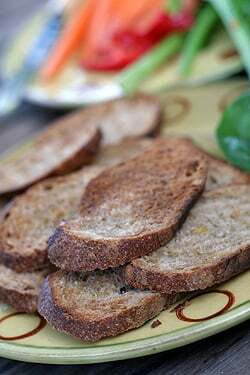 Or crumble and toss the garlic toasts into your next salad.) But having them simply slathered aïoli, we were content. The great thing about aïoli is that you always have all the ingredients on hand; olive oil, garlic, egg yolks, and salt, and it pretty much goes with everything. The downside is you should only eat it with others who are eating it as well, since you’ll likely develop a distinct garlicky aroma that will also follow you around for a few days afterward. You don’t need a mortar and pestle, but Tricia uses her mortar with a fork, which she says works better. I sometimes use a whisk, just because I like to be contrary. But those people in Provence are really sticklers for the rules and if you do make any changes, you should keep it quiet. For those of you timid about eating raw eggs, you perhaps can use pasteurized eggs (I’ve never tried them, so can’t advise) but whenever I use raw eggs, I buy them from the freshest source I know. People get freaked when they see a dozen eggs for $5, but that’s around 40 cents an egg, which is a pretty good deal. And since your body is your temple—you do want to feed it well, right? Once you master aïoli, you’ll find that it’s the perfect summertime condiment. I’ll often roast a chicken—or buy one, so I don’t have to turn on the oven, then offer a big platter of steamed green beans, hard-cooked eggs draped with anchovies, (sustainable) tuna, garlic and thyme-roasted potatoes, raw or parboiled carrots, and whatever else I feel like. Aïoli is the easiest thing in the world to put together, and vegetarians and chicken fish-eaters alike enjoy grazing around the table, all positioned around a common bowl of lively garlic mayonnaise. When making aïoli, I would start with the smaller amount of garlic, and add more when it’s done. Depending on the season, the garlic might be quite strong, and the flavor gets almost nuclear, even if you think you like lots of garlic, like I do. If it’s not going to be eaten within an hour or so, aïoli should be chilled. But it is best if it hasn’t been chilled, and it’s always best served the same day it’s made. 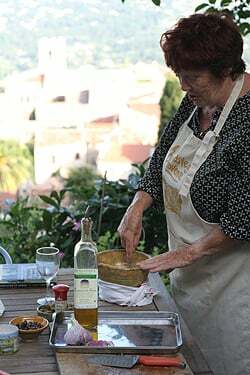 The following is Tricia’s recipe for making aïoli, in her own words. Because for one thing, as they say down in Provence, we Parisians don’t know how to cook their food. 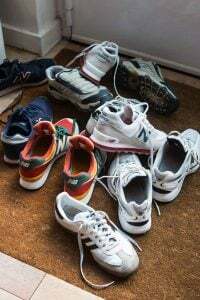 And another, whenever I stay with her, I’m always surprised to see she has about a half-dozen bottles of olive oil lined up on the counter, which she reaches for all the time when she’s cooking. And although I like olive oil, I’m more of a butter expert. “Sacré bleu, I’ve no butter for David’s petit dejeuner…after all I’ve read about him craving French butter! I decide to tough it out and tell him we’re below the butter line here in the Mediterranean; it’s olive oil country. To prove it I made my favorite aïoli for a light supper after the big lunch out. I use local farm eggs, I have least six or seven choices of olive oil to choose from, some good bread to toast and a few vegetables as crudités. 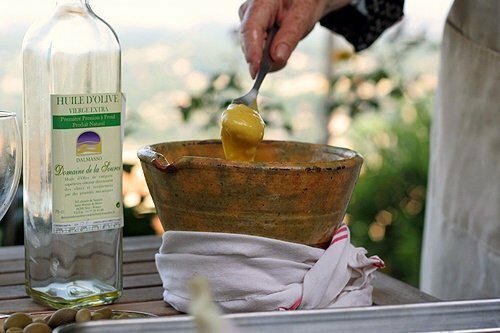 When I teach classes here in my house I often give each person a different olive oil to use so we can compare tastes at the end. For this one, I used just the local one from down in the village. A bowl of deep yellow aîoli is part of my “fast food France” meal, along with a roasted chicken from the butcher’s spit, a pan of small potatoes roasted with rosemary and a big green salad. And rosé wine, of course! 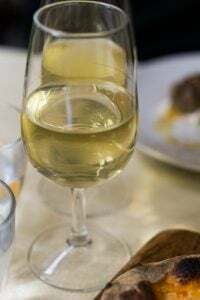 From Tricia Robinson of A Taste of Provence. 1. Crush the garlic cloves with the salt in a mortar or deep bowl until you have a smooth paste. Take out some of it as it may be too much; you can add it back later. 2. Add the egg yolk. Anchor the bowl down by tying a dishtowel around it tightly, if necessary. 3. Using a fork or whisk, add the oil to the egg and garlic mixture starting very slowly, drop by drop. 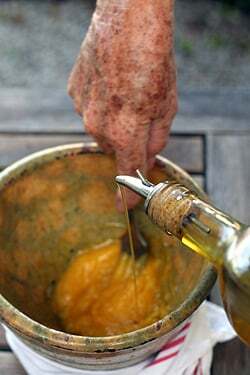 I like to use a spout in an olive oil bottle to regulate the flow but you can also drip the oil in from a spoon. As the mayonnaise thickens continue to add the oil in a very thin stream. Continue until all the oil has been incorporated. 4. If it gets too thick you can dilute it slightly with a tablespoon of warm water – don’t add more oil, it will just get thicker. Taste, and add more of the garlic, if desired. 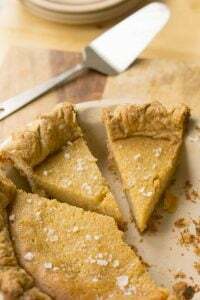 This recipe can easily be doubled, and you can make the aïoli in a food processor but the texture and taste is not as fine as hand-made. This looks fantastic, David. Twenty minutes ago, I was looking for mayonnaise in a UK grocery store but was grossed out by the options so deferred from buying any. I may make this garlic aioli today to eat along with my sesame baguette! Thank you for the recipe. It looks delicious. Oh my, that is the most luscious aioli I have ever seen. I admit I usually go the way of the impatient cook and use the blender, but I think this recipe will make me change my ways. I’d eat it with chicken too…I love roast chicken and mayonnaise on baguette as a sandwich! Yum! Jennifer and Bobbie: Well, I like it with roast chicken, too. Maybe we need to get a second opinion…any Provençalais out there? In Cataluña and most of the spanish mediterranean cost, all i oli is very popular. They use to spread it over rice dishes, and it is said that the true all i oli is done without any egg, just garlic and oil, which makes a very, very strong sauce. j’ai toujours mis une cuillere (en fait la valeur de l’oeuf – un peu moins) de MOUTARDE DE DIJON pour relever. Je dois preciser que je proviens de L’est de la France, bien au dela de la ligne huile d’olive en effet, pas tres loin de Dijon. This is about the most romantic aïoli I’ve seen done! This is more than just a recipe, but a way of life, thanks for sharing your culinary adventure. Okay, you’ve inspired me. I’m on a garlic kick right now, considering that I just pulled my garlic last week, and the other day I made tempero (wrote about it today) as well as six batches of pesto. We have oodles of new potatoes and a couple dozen chickens in the freezer and I just snapped some green beans this morning…. One question: How well does it keep? One more question: Do you toss it with the steamed/roasted vegetables, or do you serve it alongside? Bethany: Hmm, I wonder if that’s the famous garlic sauce at Zankou chicken in Los Angeles? I have a severe phobia of mayonnaise, but I think you may have just converted me. I will be making aioli tonight! ohh… looks luscious… like a very good creme patisserie, plus the entire post sounds like foreplay! Oh Yea!! You know exactly what I’m talking about then :) Never been to zankou, will try it next im in LA! Lebanese garlic sauce – yum, had that at the Palette de Courbet on the rue Gustave Courbet in Paris 16eme back when I lived in the quartier. The restaurant was just a neighborhood place, run by a friendly family, and the garlic sauce on the roast chicken platter or the fish platter was always lovely. The aoli looks delicious, but what I’m REALLY drooling over is the scenery in the background. Wow. I’d love to be there, looking at that view and eating garlicky goodness. I’m glad to see you encouraging making it my hand. I think mayonaiise by hand has a much nicer texture. Also I seem cursed making it my machine. Almost everytime I loose it and it splits, yet I’m always successful by hand. Sometimes I’m lazy though and I do it by machine anyways and I requite complete quiet in the kitchen, but it doesn’t seem to work. So from now on I’m sticking to the hand method. An unrelated question – I tried making watermelon popsicles, followed the recipe exactly as in your book! But my popsicles are very icy and have separated a bit, there is a white portion and a red portion underneath it! Any idea why? I’m happy blaming it on American watermelons!! p.s. I’ve tried a few other ice-cream recipes from your book and have had awesome results! This is the first time I’m making Popsicle. I really despise mayonnaise but I really enjoy alioli. I had it Barcelona and got addicted. My favourite is the alioli that they give you to go with the soupe de poisson. Is this a similiar to that? I would make it in an instant! gayu: I can’t imagine what that white layer would be, as there is nothing white in watermelon juice. The watermelon popsicle base and picture accompanying the recipe in the book was made with American watermelons. FYI to all: There’s an Ice Cream Q & A section on the site for inquiries. OMG, that’s something I love so much! I make that speciality a lot. Thanks for sharing! Lovely post! It made me wish I were in Provence. I don’t mind garlic breath, actually. Except if it comes from alcoholic middle-aged French men on the métro. But as I am living in Norway, this ain’t exactly a problem! By the way, in my experience, it is that horrible garlic powder that gives the worst of the worst garlic breaths. Fresh and young garlic only gives a hint of garlic in your breath, something which can be almost pleasant. Hehe. Beautiful photos, David. I feel like I am sipping Rose on that terrace now, about to tear into aioli sur la baguette au levain. And, yes, I will be making this aioli! Merci. My friends in Aix love to serve aioli with all kinds of cold roasted meats (pork, chicken, veal, rosbif) …. maybe Mr ArchedEyebrow was just a purist un peu coincé …. or upset he hadn’t thought of the idea himself! Great post and great photos as usual. This strikes a nerve since i was born, raised, and trained in Provence. 1. Pasteurized eggs? Are you crazy? 2. Count about 1 garlic clove per person. Yeah, that much. 3. Better to use the pestle to whisk the aioli. Gives a nice texture. 4. For true, rustic version of aioli, start with eggs, garlic, salt, pepper, and a little overcooked, crushed potato. the starch from the potato gives a rustic, very nice texture to the aioli. And that’s the way it is usually made traditionally. 5. in response to suzen, the “rouille” is served with soupe de poisson. It’s a variation of aioli. You’ll need to add saffron and pimiento. 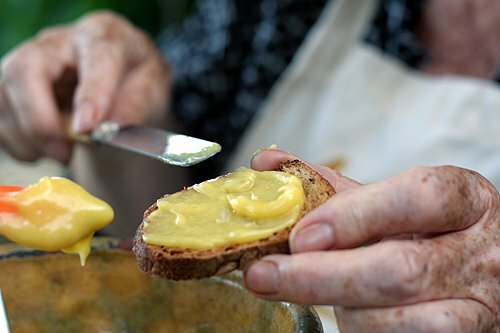 6. in response to christelle: some people put dijon mustard because it is a natural emulsifier. however, that’s Provence. No mustard. The cooked potato (another natural emulsifier) does the same thing. The first time I made aioli, my recipe (the wonderful Contessa) called for 6 garlic cloves. I halved it and used 3 and still was overwhelmed and i adore garlic. Now i use 1 and it’s perfect! Hi! Looks amazing! & What a view! I would never be indoors if I lived there! Quick question… If there are any leftovers (which I seriously doubt)… Would/could this be refrigerated? or would it just solidify? Try this aioli as a dip for fried zuchinni breaded in Panko!! MMMM AMAZING! Now I discovered why the French Aioli is so yellow: no lemon, nor vinegar added! The fotos are amazing – as always. mmm. 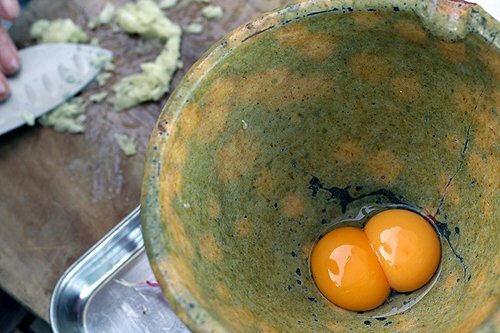 That gorgeous color belies the amazing quality of the eggs… and I can just imagine what a fabulous dinner this was. Just perfect, if you ask me. We’re in Chicago and just don’t have a reliable way to get really fresh eggs. With two little kids eating soft eggs and custards, an elderly parent who likes runny eggs in her huevos rancheros, and a husband who sneaks the raw cookie dough, I’ve gone to the pasteurized eggs and never looked back. Yes, they are expensive compared to the others, but never having to worry about someone getting sick is priceless. I haven’t noticed a difference between them and ‘regular’ eggs. Okay – off to try my hand at making the aioli! Super! Love aioli… with roast chicken? My God that sounds most devilish, but in the best possible way! Thinking I’m seriously glad you can’t see what people try to pass as “aioli” here, and by here I mean NZ here, not here as in my own kitchen. Yes! Aioli is terribly delicious. I recently made some to accompany a bourride dinner. It didn’t come together the first time, but was perfect the second time around. I encourage everyone to try it. Aylin: You can refrigerate it overnight but it loses some of it’s character. Chef Gui: I haven’t used pasteurized eggs, but for those avoiding raw eggs (pregnant women and folks was compromised immune systems), I did want to put the idea out there because I knew that it would come up. The link in the post has more guidance on egg safety. 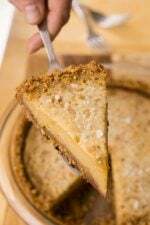 Mar: There are also versions with breadcrumbs or almonds in place of the egg, that are delicious, too. Katie: 6 cloves of garlic?? Yikes! What a beautifully-written post! 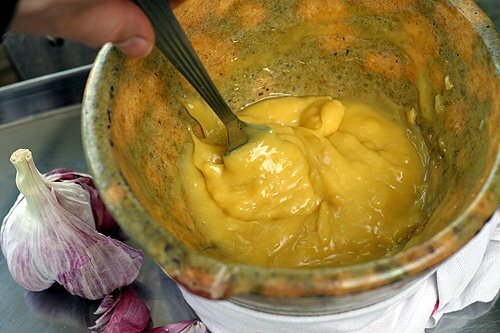 The color of this aioli is stunning. 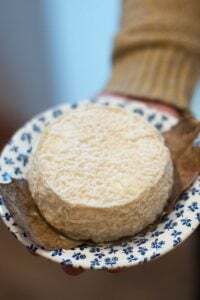 I bought something like this at the market in Revel, just southeast of Toulouse and it had cheese in it. It was a lovely spread and I think Aoli was the name.. he said it had garlic, oil and cheese in it. It was delicious. I have no idea what kind of cheese but the end product was whiter than yours and very spreadable and it was hot. He was stirring it in a large cauldron at his booth. Mon dieu – that looks incredible. I went to Tricia’s site, but there is no information about classes past 2008. I want to go….someday….while figs are in season! Mmmm. . . aioli! 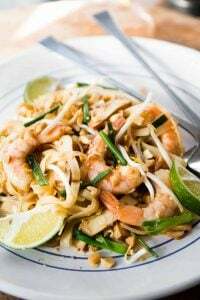 I’m planning to make one this weekend for friends, but as they don’t care for salt cod (and it seems to be increasingly hard to find here in SF) I’m serving it with chicken and shrimp in addition to whatever vegetables I can find at the market. 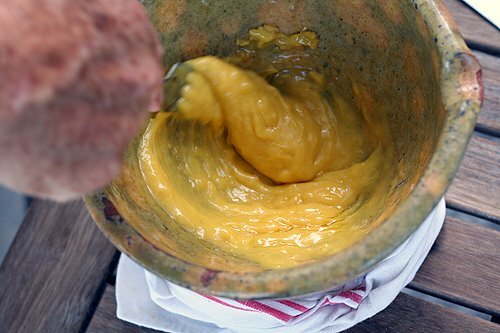 I will not, however, be making the mayonnaise by hand–the last time I used a mortar and pestle, I had the worst tennis elbow for a month! I’m willing to suffer for good food but maybe not that much. I’ll use a KitchenAid mixer rather than a food processor, though–I think the end result is better. Chef Gui – Thank you so much for guidance on the “rouille”. I will give it a try and put myself back in Cassis enjoying soupe de poisson on the port. I’m afraid to make this for fear that I will spoil myself. You know, kind of like making your own ice cream, or your own bread, spoilt? Yep. I’m sure of it. I remember my mama wielding her own fork just so to make our mayo; thanks for nudging up that memory. And I must say, what gorgeous egg yolks. Cooked eggs can be much scarier than raw ones. Eggs are quite easy to purchase in this area of Texas there are many people who sell them from their farms. The grocery charges 99 cents for a dozen large eggs. A test I learned for a bad egg..Take a tumbler of water and if the egg sinks it is fresh..if it floats…throw it away..no matter when you purchased it. This is helpful if you put your eggs in a refrigerator container and then dispose of the carton. I use the older eggs for hard boiled..NEVER USE A FLOATING EGG…This is where the gasses are expelled into the air part of the egg. Seems to work…I haven’t been sick from an egg. Also, wash hands after working with raw eggs to avoid contamination. Love the recipe…Just fun to see how you create with ingredients in someone elses kitchen!!!! I just want to expand on the point as to why it is so important to add the oil slowly. 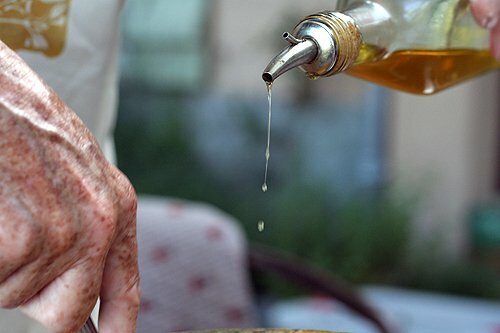 Extra-virgin olive oil can become extremely bitter and unpleasant tasting if it is over-worked (for more info you can read my article about olive oil becoming bitter) and ruin the whole batch! I prefer to get around this problem by using pure olive oil, then whisking in some extra-virgin gently at the end for flavor. It’s a funny thing that mayonnaise in a jar (or squeezy tube, or whatever) is one of the very few foods I find really disgusting, yet when I make it myself, i can’t get enough! And as Trisha says – it really is the best kitchen therapy. Gorgeous photos — I want to slather that aioli all over myself! I covet that mortar and the view. Lucky you and thank you for sharing. wow! are you a mind-reader? I was thinking of making a dip for roasted potatoes and thought aioli would be perfect. now I come to your site and this is what I see? COOL!!!! thanks for the great idea and pictures! Oh dear I like roast chicken with aïoli – better keep that one quiet then! Mmmmmm, and this can even be made in the depths of Winter like it is here. Lunch tomorrow I think. For anyone dealing with really garlic-squeamish/garlic phobic guests than reckon they keel over at the aroma when its cooked three houses away – you can sneak in roasted garlic….. Chef Gui, I know you! I used to live in your city before moving to David’s — you did the cooking for a wine seminar held by Jim and Mark a few years ago. Small world we live in….Thanks to BOTH of you for the aioli — I now have a recipe for aperos tomorrow night. gloria: I don’t think the French would mind, but you should take care when storing fresh garlic in olive oil, as it’s a breeding ground for botulism. Rose-Anna: I’m also not fond of store-bought mayonnaise. There’s something I find unappealing about it. But oddly, I don’t mind the tofu mayonnaise I’ve bought in natural food stores. Weird, isn’t it! What wonderful photos! I can’t imagine a more perfect day — lazing away the afternoon in Provence, drinking rosé. And, in addition to freshly made aioli served with Provencal veggies, that stunning view! 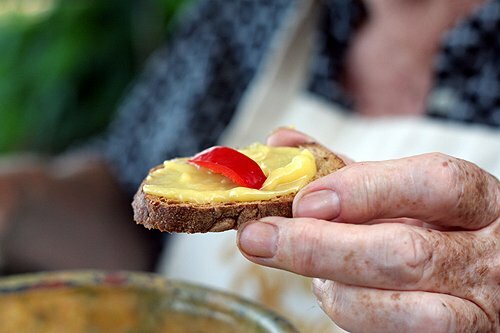 botulism…oh my god…being very popular the habit of putting any kind of eatable thing in olive oil to flavour it these days (hot chili, rosemary etc…)…I understand why I can’t avoid the feeling of too many people under the effect of botulism treatment! David, care to share more info on the bread and almond ones. I’m Catalan, and haven’t heard about those (but that’s probably because I’m an ignorant urbanite, and they sound delicious… or are they aïolis and not alliolis?). 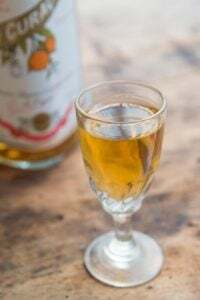 The one I have heard about and actually tried is allioli made with quince, where the sweet, citrusy paste of stewed quince is mixed onto the emulsion… Mmmmm…. Mar: Romanesco sauce is an emulsified sauce made with bread crumbs and almonds (and tomatoes &roasted peppers.) One that seems more ‘pure’ is amarillo, which is mostly bread, garlic, almonds, and oil. I’m not an expert on Catalan cuisine (although I love it), but there seems to be lots of regional variations, not just in Spain, but in France and Italy as well, on emulslified garlic-based sauces such as this. Alex: That’s a great story. So many kids (and adults) are growing up without any sense of how food is grown or made. I still love going to orchards, bakery kitchens, farms (and even food factories) since I just think it’s fascinating how everything we eat is made. Zankou chicken! I love that place. Especially the garlic sauce. My partner grew up in LA, and introduced me to Zankou a few years ago. Every time we go to LA we have to stop there. I wish they had some locations in SF. That aïoli looks great…I think I’ll have to make some this weekend, along with a roast chicken! On kids and cooking… my 9 yr old daughter is learning how to cook (must wear toque and pink Williams-Sonoma apron!) and I remember back when I first allowed her to crack raw eggs into a bowl by herself. Talk about pride and a sense of accomplishment. Magic! 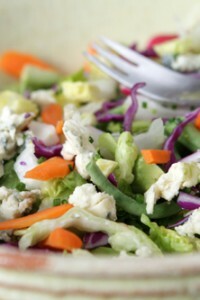 These photos are just beautiful and will make me think more happily when I next make mayo! Thank you for sharing. David, here’s a link you might like: http://www.fermes-brie.fr/fromagerie.html — one of the few small, independent Brie producers left. With tours. And tasting! I love the way her hands look. Imagine the amount of food they have prepared. So. Any ideas for how to use flopped aioli (as in, separated, curdled, the works…)? oh.my.god. that is luscious! I love your shots of her gorgeous hands and the crusty bread and divine aioli! Aw, I had new pressed olive oil, just laid eggs and fresh garlic. Oh well, I whisked some of the aioli back into the eggs whites and ate it with leeks vinaigrette. Tasty! The aioli of course, looks delicious. It’s late here now and if I had the right ingredients downstairs this is what I would do with that aioli. Provencal food rules be damned! I would toast two slices of this morning’s perfect baguette with a touch of olive oil. Then I would layer some of that ailoli then some fresh mixed greens, a few slices of poulet crapudine (cold) then some watercress a few fresh shredded carrots and thinly sliced red bell peppers then a bit more aioli on the top slice then voila, my dream midnight snack! Since that is not possible, I have to find something else for my bed time snack. I’m going to bed hungry aren’t I? hi David! how big were the cloves used for the aioli? is it as big as a thumbnail or as little as a pinkie nail? from my experience, the smaller the clove the bigger the flavor. so should i adjust the number of cloves to be used? i dont mind the garlic taste and breath. thanks! i was going to make some financiers, and then use the yolks for some creme brûlée. actually, i think I can get away with making both! I’m a big fan of using young garlic shoots (so easy to grow), chopped then ground to a paste before adding egg and oil. Gives a lovely sweetish garlic freshness to the aioli and has attractive slivers of green from the leaves. (fantastic on warm roasted CHOOK in a roll). A little mashed Potato is a great idea, esp when making skorthalia. Ahhhh… one of the great joys of life. 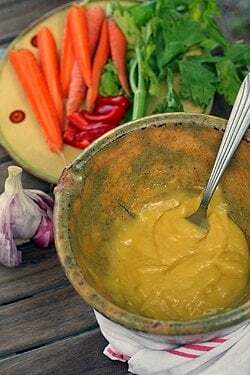 The extremely pungent, crowd pleasing Aioli. Very nice recipe. Terrific photos. Well done! ahh, those hands… beautiful. nothing like homemade mayonnaise and loved seeing the photo of the crushed garlic on the knife blade. pure goodness right there. Well I wonder what they would think if they saw me putting it on burgers? But along with all homemade condiments, buns, and great burgers, it made our 4th of July in Rome! My aïoli got all broken … am going to have chow tips to fix my broken mayonaise. I´m from Granada in the South of Spain, and this paste is called here Alioli, originally All-i-Oli. All-garlic and Oli-olive oil. Traditionally this paste is made in the spanish mediterranean area, from Cataluña, Valencia, Murcia and Andalucía. 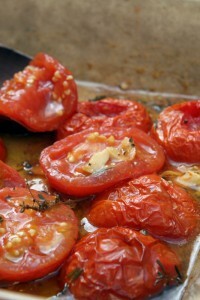 Although now it is used a ligther version with garlic, eggs and, lemmon and olive oil. Indeed it is a mayoinnaise with garlic. 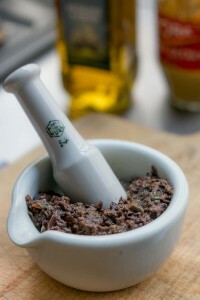 To make it we only use garlic and olive oil, we crush the garlics with the olive oil slowy until to get the result. ¡¡Sorry for my english!! but i hope that you like my comment.